Those of you waiting for deals on John Bartlett's line of menswear for Liz Claiborne have been out of luck until now—New York department stores haven't been carrying it so seasonal sales or not, no dice. 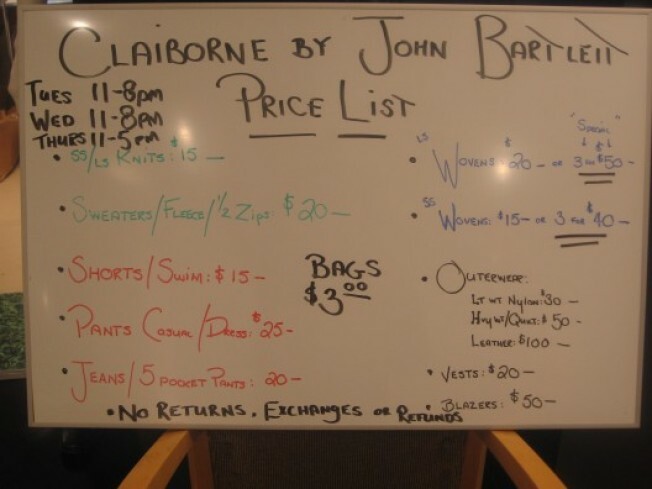 But the John Bartlett for Claiborne sample sale started this morning and you can pick up pieces straight from the lookbooks—many still current—for a song at the Liz Claiborne showroom. And the deals are really out of this world. The clothes retail at a fairly affordable price point to begin with, especially considering the wearable lines and good construction—think $60 denim, knits that start at about $40, a complete suit for under $300. Then, deduct a good 60% from that. And (bonus!) this stuff looks to be mainly overstock rather than samples—which means the best quality pieces still wrapped in plastic and carefully hung on branded hangers are available in just about every size and color. We loved the soft, red and black micro-plaid button down shirts for $20 (or three for $50) and the plaid barracuda jackets and half-zip anoraks ($30) in blues and grays. Five-pocket trousers in warms khakis and sleek, expensive looking hard denim in a classic slim and straight fit were only $20. Jauntily printed swim trunks and basic summer shorts that seemed neither too long nor too baggy we divided up by size in boxes—pieces were a mere $15. But the deal of the day has to be complete suits—sold as separates—for a grand total of $75. And these were slim, modern, two-button suits in shark gray and warm black with flat-front trousers. A winner of a sale—a sized-organized room full of incredibly wearable basics at (clearly-marked) fire sale prices. Get there before it's gone.